A fraction is actually a division. The numerator is divided by the denominator. To change a decimal to a fraction you divide the numerator by the denominator. You may need to use a calculator. To change from a decimal to a fraction the decimal point is removed and the whole number is written over powers of 10. Percentages are fractions with a denominator of 100. To change from a fraction to a percentage, multiply the fraction by 100%. 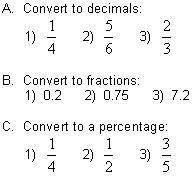 Fraction and decimal problems for you to try.